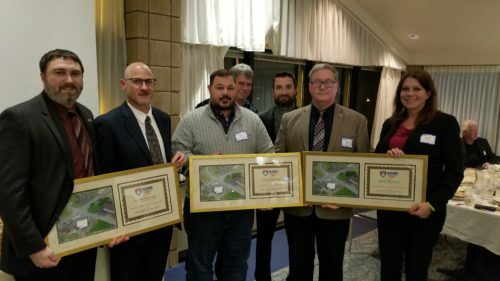 The Southwest Pennsylvania Section of ASHE selected the SR 40 Section 10B – US 40/PA 381 Intersection Improvements Project as the 2018 Project of the Year (Greater than $3 million but less than $10 million). The project is in PennDOT’s District 12 at the intersection of US 40 and PA 381 in Wharton Township, Fayette County. US 40 is known as the National Road and is one of the oldest roadways in the US. Prior to the project, the north and south legs of PA 381 intersected US 40 approximately 200 feet apart. These formed closely spaced offset T-intersections that created operational and safety deficiencies. The project removed these deficiencies by relocating the southern leg to form a single four-leg intersection. JMT provided alternative analysis, preliminary engineering, final design, and construction phase services for this project. The project design efforts included horizontal and vertical geometry of PA 381 roadway realignment, utility coordination, SUE, drainage, stormwater management design, environmental permitting/clearance, temporary traffic control, pavement markings, and design of a new traffic signal. At the awards dinner, the PennDOT construction inspector noted that he has received positive comments from the public. He was told that prior to construction of the project, accidents or near misses occurred regularly (at least one a week), but none have occurred since the new signalized intersection opened.